With interest rates around the world in low single digits, investors have been forced to seek stocks paying a decent dividend yield to satisfy their income requirements. In Australia, investors have turned to high dividend payers such as the big four banks (a tough call given the headwinds from the Royal Commission and fears of a housing crisis), some resources stocks, and companies in the A-REITS/utilities sectors. This, however, opens investors up to certain country- and sector-specific risks. One way of mitigating these risks is to seek yield outside Australia. At first glance, it would appear that relatively stable, high levels of income are harder to find outside Australia than locally. 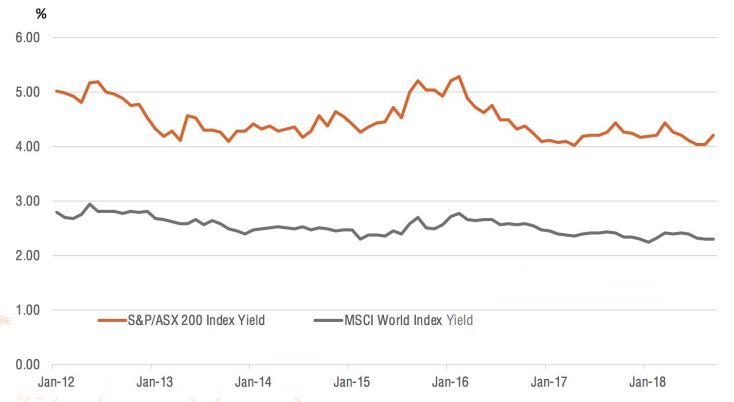 The chart below highlights that dividend yield on the MSCI World Index is significantly lower than that of the S&P/ASX 200 Index and has been consistently so over time. Source: Bloomberg. You cannot invest directly in an index. Past performance is not an indicator of future performance. This poses a challenge to investors – how do I find and invest in high dividend paying stocks outside Australia? 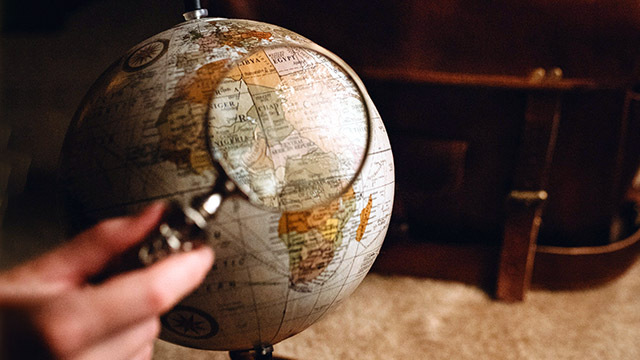 The BetaShares Global Income Leaders ETF (ASX Code: INCM) has been designed to help Australian investors achieve diversification via global shares while still focusing on strong income returns. The fund aims to track the NASDAQ Global Income Leaders Index, an index that comprises 100 high-yielding global companies with track records of paying regular dividends. With an underlying index dividend yield of 5.4% (gross of withholding tax), 4.67%1 net of withholding tax (as at 28 February 2019), which compares favourably to that of the Australian share market, INCM can be a valuable complement to an equity income allocation. As an exchange traded fund, it has the added benefits of being transparent, easy to access and diversified. not exceed prescribed volatility thresholds. In addition, INCM’s Index has a track record of notably lower drawdowns during periods of market falls compared to the MSCI World Index. As shown below, during the market pullback in late 2018 (28/9/2018 – 20/11/18 to be precise), INCM’s benchmark index (below in white) was down just 3.81% compared to MSCI World (below in orange) – down 9.33%. Source: Bloomberg. Performance shown is the Nasdaq Global Income Leaders NTR Index, not the INCM ETF and does not take into account the ETF’s fees and costs. You cannot invest directly in an index. Past performance is not an indicator of future performance of Index or ETF. Source: Bloomberg. Past performance is not an indication of future performance. If there is a change in Government in the upcoming Federal election, there may be another potential benefit of investing in a fund like INCM, given the Australian Labor Party’s plans to cancel the refundability of unused franking credits. Assuming the ALP’s policy is implemented, investors with excess franking credits may benefit from holding investments that provide a mix of franked and unfranked income. For those investors, a cash yield from unfranked income, such as income from an international investment like INCM, becomes more valuable than an equivalent grossed-up yield from a franked income stream (this is not intended as tax advice – consult a professional adviser before making investment decisions). Note: The Fund is not issued, endorsed, sold or promoted by Nasdaq and Nasdaq makes no warranties and bears no liability with respect to the Fund. 1. Source: Bloomberg. 12th month trailing dividend yield net of withholding tax for underlying Index, not ETF. Yield will vary and may be lower at time of investment. I am interested in this activity. Can you be more specific in this matter. I have attached the links to the factsheet and fund flyer below, this will offer more information on our ‘Global Income Leaders ETF’. Okay that sounds good but what are some of the downsides of this type of investment? This fund still has potential downside within market downturns, the historical data just shows that it has participated in less of the downside compared to the MSCI World due to the funds investment approach. I have attached below a copy of the PDS which outlines all associated risks with INCM.